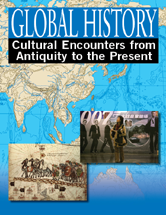 Written in a lively, engaging style, and designed to complement social studies curriculum as well as programs in the social sciences and humanities, this reference vividly recreates and analyzes pivotal encounters, exchanges, and conflicts between cultures and civilizations that profoundly influenced the course of human history. Barbarians in China, 206 B.C.E. –907 C.E. Barbarians in the Roman Empire, ca. 300–700 C.E. Chavín Culture in Pre-Columbian Peru, 900–200 B.C.E. China's Contact with Southeast Asia, 200 B.C.E.–1433 C.E. Chinese Writing System: Spread Across East Asia, 200 B.C.E.–1200s C.E. Eurasian Trade and Migration, 5000–500 B.C.E. Greek Bronze Age: Minoan and Mycenaean Influence and Exchange, 1700–1200 B.C.E. Greek Empire: Creation of the Hellenistic World, 327 B.C.E.–600 C.E. India's Cultural Expansion to Southeast Asia, 500 B.C.E.–900 C.E. Indo-European Migration to the Indus Valley, 1500–500 B.C.E. Jerusalem and the Rise of Monotheistic Civilizations, ca. 950 B.C.E.–700 C.E. Nok Culture and Spread of the Bantu Peoples, 500 B.C.E.–500 C.E. Olmec Influence in Mesoamerica, 1250 B.C.E.–300 C.E. Persian Empire of Darius, 521–486 B.C.E. Phoenician Trading Empire and Spread of the Alphabet, 2500–800 B.C.E. Roman Empire and the Mediterranean World, 46 B.C.E.–330 C.E. Silk Roads, 400 B.C.E.–900 C.E.